My husband and I just moved and got our first grill…our lives have been forever changed! :) I have literally been grilling up a storm…you name it, I’ve grilled it! Today I’m sharing Pineapple done TWO ways…as a dessert and as a salsa! Our friends at House Blend Cafe and Catering in Ocoee always brings us this amazingness they call Pineapple Salsa for Z88.3’s fundraiser. While I won’t admit how many times Ellis, Tyler and I go back for “seconds”, I will say, if you’ve never been, go try it! :) They are a restaurant who does good…all their profits go back into missions overseas and here locally. Food with a mission, we absolutely love them…so much so, that I used them to cater my own wedding! While they haven’t actually shared their own pineapple salsa recipe, I made this one up to share based on the joy that their salsa brings to so many of the Z family during fundraiser! Don’t worry, if you are intimidated by the grill, don’t have time to fire it up or don’t have one, you can still make the pineapple salsa! When you are done, your family can find a spot in the yard to grow your own pineapple from the tops of the pineapples you purchase. Just google the instructions on how to grow one at home. I remember as kids, we used to get impatient with how long the process would take. It was awesome when that first baby pineapple began to grow. We thought it was the coolest thing because we planted it! Cut the top and sides off both pineapples. Leave the core in the pineapple and cut into pretty thick steaks (the thinner you cut it, the easier it is for your pineapple to burn; thicker slices are easier to dice later for salsa). Bring in your honeybee to brush your favorite honey on all sides of every piece of pineapple. Throw on grill until your pineapple caramelizes and becomes a nice golden color with beautiful grill marks. Serve slices (from one pineapple reserving the other one for salsa;) warm as dessert (the core is soft enough to eat as well at this point). Feel free to top with really good vanilla bean ice cream…yum! Dice up your grilled pineapple and add to a mixing bowl (Not feeling like grilling? Skip the honey and the grilling and dice up the raw pineapple if you just want to make the salsa without grilling). Dice up your raw red onion, jalapeño (take out the seeds if you are worried about heat) and cilantro (make sure the leaves you chop up are no longer on the stems) and add to a mixing bowl. Literally throw in a few shakes of salt and pepper and mix with a spoon. Voila! You’ve got the most amazing pineapple salsa that is ready for chips to take the plunge into…You’ll also see this Quick Family Recipe sneak back in next week when we use it as a topping for our fish or shrimp tacos! 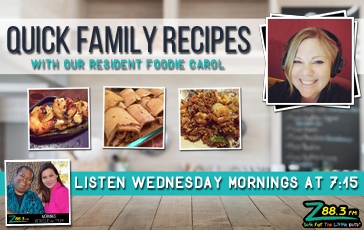 As usual, let me know if you make it and how it turns out for your family. 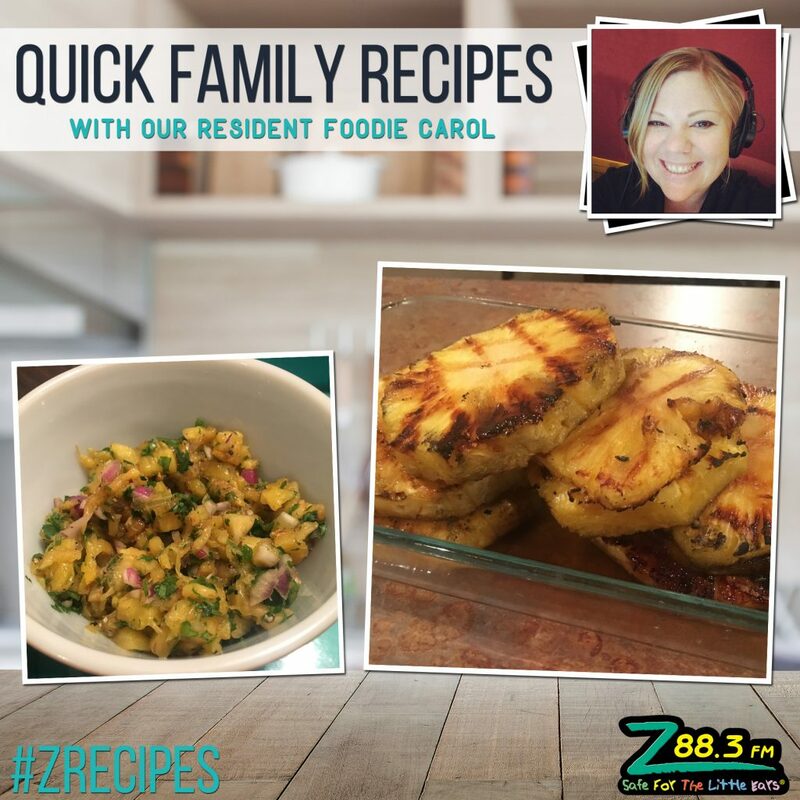 Tag your photos online with #ZRecipes and #Carolbake!